Pads of paper are sprinkled around my apartment – on my nightstand, in the kitchen and bathroom, next to the phone and my rocking chair. I’ve gotten to that age where if it isn’t written down, it doesn’t exist. So I pen these little reminders – things to do, grocery lists, . . . and blog ideas. 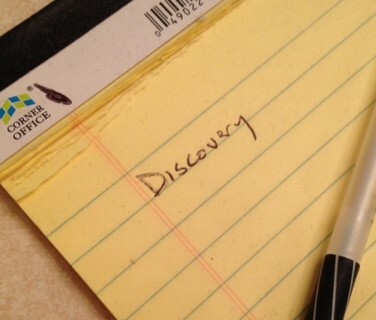 So I was somewhat dismayed when I read one note that simply said “Discovery.” Huh? I know this word was an idea for a blog, but I am clueless about the context. Whatever did I mean? The space shuttle? No, I had just seen “Atlantis,” not “Discovery.” The TV channel? Not that. My problem was that I couldn’t remember the background to the word. I needed to know the surrounding circumstances that caused me to write this down. In real estate sales, the three laws are “location, location, location.” When interpreting the Bible, the three laws are “context, context, context.” People often take verses out of context and twist their meaning – a dangerous practice. But this misapplication also happens when we experience difficulties in life. When we experience troubles, we need to ask, “What is the context? The surrounding circumstances?” Sometimes we know we suffer from the consequences of our own actions or the direct result of evil people preying upon us. Other times the reason is not so clear. Such was the case with Job. When he suffered multitudinous disasters – the death of all his children, theft of his flocks and wealth, ill-health and disease – his friends and wife blamed him. These events were the result of his misdeeds, they said. Job protested his innocence. But the Bible says that God allowed Satan to test Job through these trials. What was the end result? Job admitted that he didn’t understand why bad things happen, but he knew that God was God and Job wasn’t. He grew through these experiences and learned to trust in the wisdom of the all-powerful Creator of the Universe. Even in the nightmares of darkness in this fallen world, we can trust that God is always with us and that He can use even bad things for good. So, when you suffer hardships, ask God what He wants to teach you.
. . . And if I ever remember what I meant by “Discovery”, I’ll write that blog. 🙂 Yep, my friend, it’ll be great to read your blog when you remember it. But loved what you did with this one! Context!!!! You hit that one on the head–context, context, context! What I love is the fact that you lost yours in the midst of finding your sticky note. I do agree with you in this–if it’s not written down, it doesn’t exist. Well said, my friend. Great job in giving context to trials.